The switch is possible.Nearly 80 percent of the world’s energy needs could be produced from renewable energy sources by 2050 according to a study by the Intergovernmental Panel on Climate Change (IPCC). Wind power alone can contribute as much as 20 percent to a future renewable energy mix. Viewed globally, wind power currently makes up only 0.2 percent of energy production and covers about two percent of the electricity demand, but this number will be rising quickly. The economic crisis was not able to stop the trend towards wind power over the long term. At the end of 2010, the total installed output of wind power plants was roughly 195 gigawatts, 35 gigawatts more than one year before. 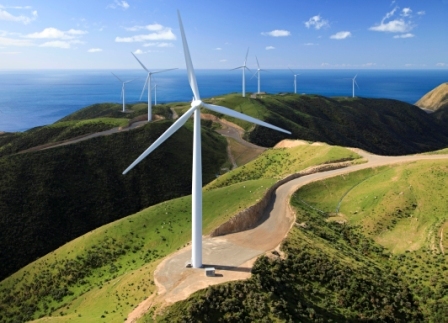 For 2011, the Global Wind Energy Council expects another 40 gigawatts to be added. Wind energy is developing most quickly in China, where the installed wind power output has doubled every year since 2005. With a total capacity of 42 gigawatts, China has now surpassed the USA at 40 gigawatts and added 16.5 gigawatts just last year alone. The next places are held by Germany at 27, Spain at 20 and India at 13 gigawatts. With wind power plants that are a generation newer than those found in Germany, for example, Spain has shown that it is not only the size of the plants that matter. Despite a lower total output installed, favorable wind conditions allowed Spain to produce considerably more electricity than Germany in 2010 (43,000 gigawatt-hours) to meet 16.4 percent of the country’s entire electricity demand. Germany produced 36,500 gigawatthours, or 6.2 percent of the national electricity consumption. With respect to the size of the country, Denmark holds a clear lead. Nowhere else is more wind energy produced per person. The pace of wind power is increasing because it is the most technically mature of the new, clean energy sources and also the most competitive. Catastrophes like that one at the Fukushima nuclear power plant, continuously rising petroleum prices, the global obligation to drastically reduce CO2 emissions and the EU goal of using renewable energy sources for one-fifth of energy production by 2020 will only accelerate this development further. “With existing orders totaling over ten billion euros and the rapid expansion of our international manufacturing network, we are ideally positioned to become one of the world’s three leading providers of wind power plants by 2012,” stated Wolfgang Dehen, global head of Siemens Energy. 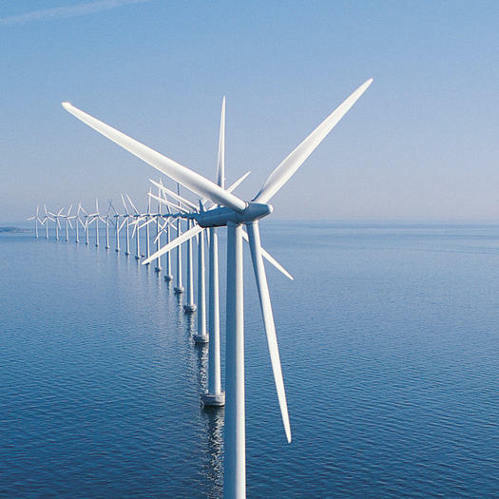 Coastal regions are particularly attractive for the construction of wind power plants, and the advantages of offshore wind power plants are clear. Stronger and more regular wind currents are found over the ocean than inland. However, both the installation and operation of these massive wind turbines on the high seas pose special challenges. The burden on the technology increases with the distance away from the coast, the depth of the ocean floor and the roughness of the environment. They also represent a massive undertaking – from transport, erection and connecting to the grid all the way to service and maintenance. For these reasons, work is underway to advance the technology in all areas, from the increasing industrialization of the installation of offshore plants to intelligent sensor systems for monitoring them. Currently one of the most exciting research projects is floating wind power plants, which are being developed by Siemens together with the Norwegian energy company Statoil and which could open up even more new territories for wind energy. An initial prototype is already in operation off the Norwegian coast. The core of this system is a 120-meter long floating structure of steel, concrete and ballast tanks that extends deep enough to bring the center of gravity far enough below the surface of the water. This should avoid fluctuations in operation even during high swells. To prevent the platform from floating away, flexible steel cables anchor it to the ocean bottom. Researchers hope that this will make it possible to securely install windmills at depths of up to 700 meters. Massive plants are being built in the seas around Europe, particularly in Great Britain and the Scandinavian countries. Offshore wind parks are also seeing increased interest in Germany. In total, the potential of wind energy on the open seas in Europe is estimated at 100 gigawatts, of which only two percent has been used so far. The European Wind Energy Association (EWEA) expects that up to 40 gigawatts of installed offshore power can be realized by 2020. Naturally, tremendous potential remains to be tapped on the coasts of the USA and China. In other words, there is no end in sight to the boom in offshore wind power. Multiple major projects are in the pipeline. Siemens, market leader in the offshore business, recently received the order for the offshore wind park Borkum Riffgrund. Here, 55 kilometers off the German North Sea coast, 89 wind turbines with 120-meter diameter rotors will be installed in water depths of 30 meters. With an output of 320 megawatts, the wind park will supply clean electricity for up to 330,000 households as of 2014. Although the fascination of energy production on the high seas via wind power with its gigantic potential and technical dimensions, is undeniable the perspectives for wind energy on land are no less impressive. In Germany, roughly 65 percent of the electricity demand could be met with onshore wind energy, according to a study by the Fraunhofer Institute for Wind Energy and Energy System Technology published in April this year. This will not even require filling the entire country with windmills. Two percent of the area of Germany would suffice if 3-MW plants were installed with an average hub height of 100 meters. In Austria there are enough regions with nearly perfect climatic conditions for the erection of wind power plants, such as in the Weinviertel or in Northern Burgenland. At the start of 2011, there were 625 windmills throughout the country with a total output of 1,011 megawatt connected to the grid, producing roughly 2,100 gigawatt-hours of electricity per year, corresponding to the demand of about 600,000 households. The Austrian company IG Windkraft has calculated that a doubling of the currently installed output is required to replace the amount of electricity imported in the year 2010 (and thereby also nuclear power). 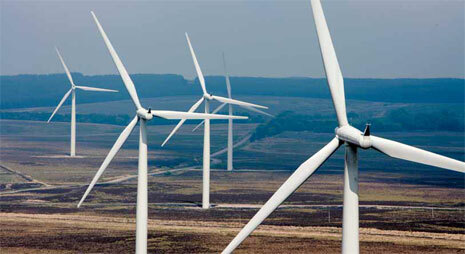 New wind power plants with an output totaling 120 megawatts are expected to be built this year. “However, we would have to return to the installation pace of earlier years of about 200 megawatts per year,” said Stefan Moidl, general manager of IG Windkraft. The progress in recent years has affected the costs of these large windmills. Since 1990, the prices for wind energy plants have fallen by over 30 percent – alongside significant increases in efficiency. The first wind power plants of the 1980s achieved a nominal output of 55 kilowatts and a yield of 35,000 kilowatt hours per year. Today, large plants deliver 6,000 kW and more, supplying roughly 20 million kWh of electricity. Not only do they operate much more efficiently, they are also quieter and calmer and can be integrated better into the power grid. The gearless wind turbines from Siemens are among the most recent technical innovations on the market. Normally, a gearbox converts the low rotation speed of the wind rotor into a high rotation speed for electricity production. In the gearless plant, a synchronous motor stimulated with permanent magnets converts the rotor motion directly into electrical energy, which significantly increases the efficiency of the system. In other words: more power with lower weight, half the number of components and less maintenance expense due to the smaller number of rotating parts, which in turn improves profitability. In Denmark and Norway, gearless wind turbines with an output of three megawatts and a rotor diameter of 101 meters are already in use, and the Bison wind power plant in the USA has ordered fifty of these new turbines. In the meantime, a second model of this new generation of wind turbines has been presented: a 2.3-MW machine with a rotor diameter of 113 meters, optimized for use even at lower wind speeds. A 6-MW turbine of the same design should follow shortly. The new 2.3-MW turbine also makes use of a new 55-meter long rotor blade, the B55-Quantum Blade, which increases the wind yield at the blade while also further lowering the noise level. Technological advances have brought attention to another interesting aspect for the expansion of wind energy: repowering – the replacement of older wind power plants with new, more powerful and more efficient ones. Double the output and triple the electricity yield with half the number of plants on the same area is the current formula. This also means that we do not necessarily need more windmills than today to produce more clean energy. 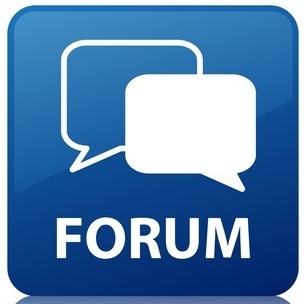 Efficiency improvements alone have much to offer. 52-meter long rotor blades for gigantic windmills, each weighing 16 tons, are produced by Siemens in Denmark. Every blade must achieve the performance required by the customer without subsequent realignment over its 20-year lifetime. Several years ago, a process was developed by which the blades can be produced as a single, closed piece. With the IntegralBlade technology, no adhesives are required in the manufacturing. The blade has no seams, the manufacturing hall remains clean and the employees are not subject to any fumes. The blades are baked in shells filled with fiberglass, a fiber-plastic composite. The rotor blades do not contain any problematic PVC, meaning they pose no waste disposal problems after their 20-year lifetime is up. They consist of 90 percent fiberglass, which is a recyclable material. Overall, up to twelve tons of fiberglass go into the long blades. An inner layer of wood is also placed between the plastic strips for reinforcement. The interior space is filled with air pockets. These prepare a path for several tons of liquid epoxy resin to move between the pockets and fiberglass, evenly bonding both sides of the blade together. Then everything is baked at 70 °C for eight hours. With this technology, it takes only 48 hours from shell assembly to baking rather than several days. The blade is then adjusted and painted white; just a few weeks later, it will be spinning in a wind park.